I've been thinking some more about kanban and visualization. A while ago I blogged about my security-scan kanban idea of introducing proper physical kanban onto the board. 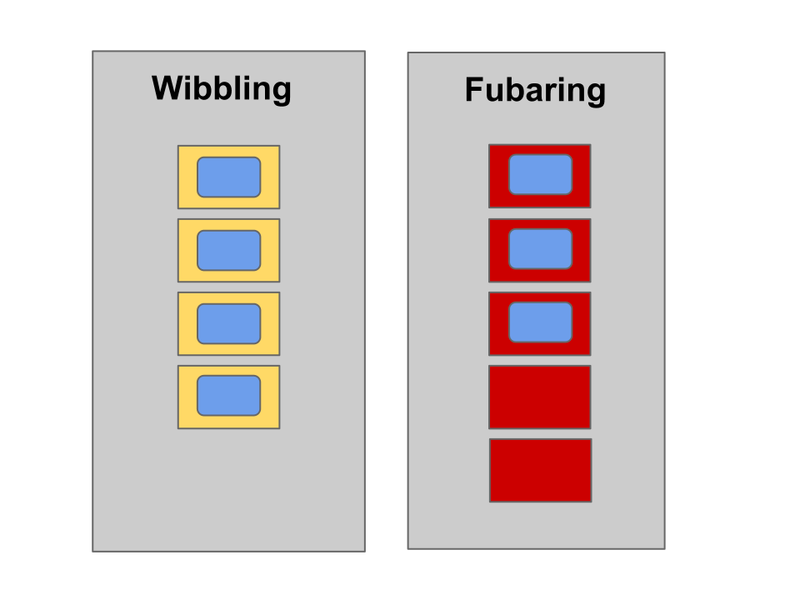 Instead of writing a work-in-progress limit of 5 at the top of a column you introduce 5 physical "empty-tray" kanbans. 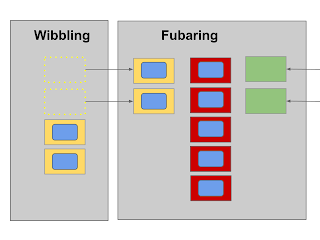 Different columns use different coloured kanban. 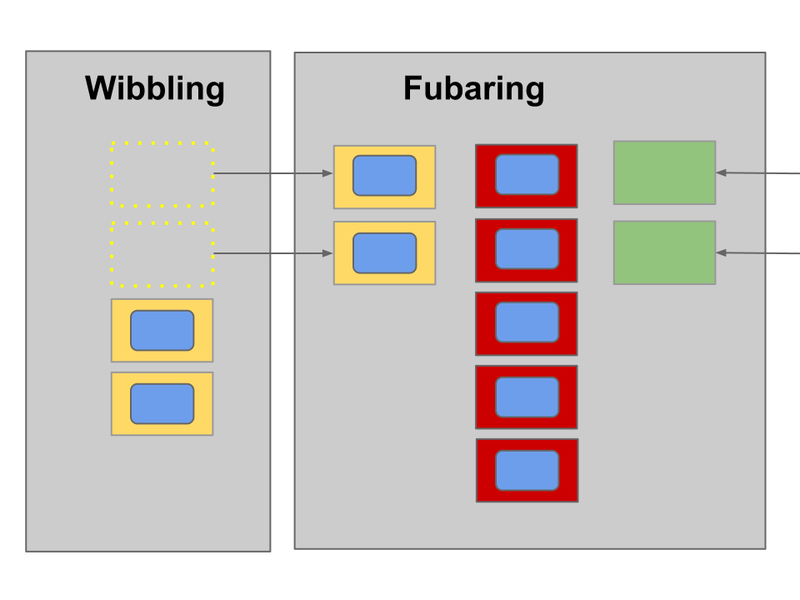 For example, here's a very simple kanban board with a Wibbling limit of 4 yellow trays and a Fubaring limit of 5 red trays. The stories are in blue and must always be in a tray. I mentioned how this allows genuine pulling. 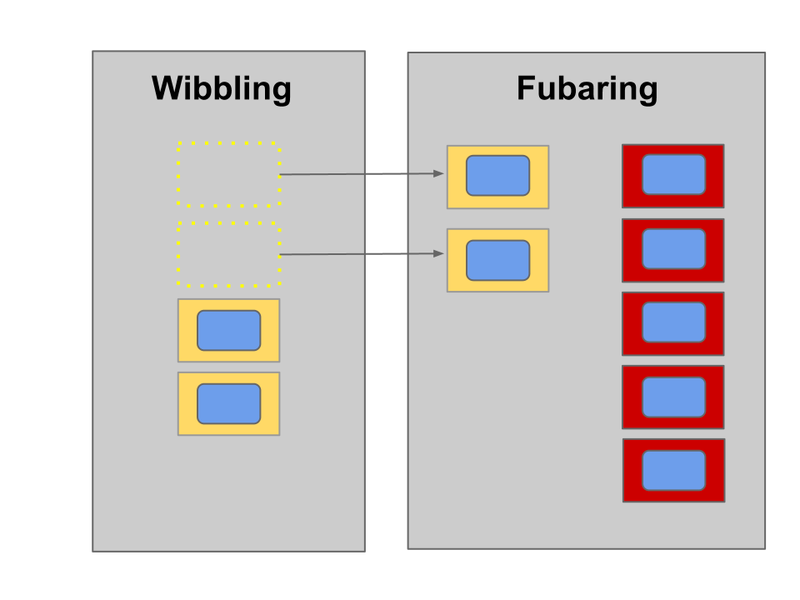 For example, the Fubarers can signal they're ready to pull a story from the Wibblers by moving an empty red kanban tray into the Wibbling column. 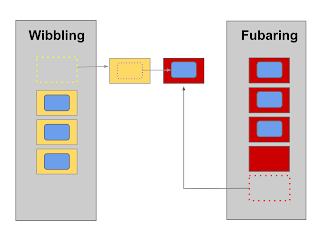 I said that the Wibblers could simply move a done blue story from its yellow kanban into an empty red kanban. 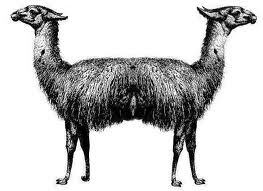 Something about that bothered me and I think I now know what it is. Once again it's about visualization. What bothers me is that there is no representation of whether a blue story is done until it's moved into an empty kanban. 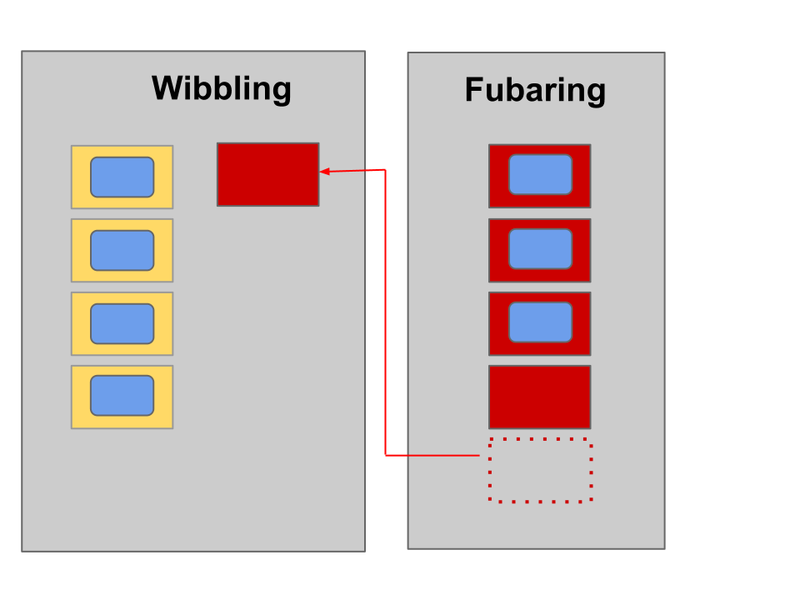 There is no visual display of whether a blue story actually is "in-progress" and being worked on, or whether its "in-queue" and waiting for an empty red kanban. That feels wrong. More recently, I blogged about about the common pattern of splitting each column; one for ongoing, one for done, like this. Something about the done column didn't feel quite right either. There's one representation of flow ; thin columns with kanban of one colour only. 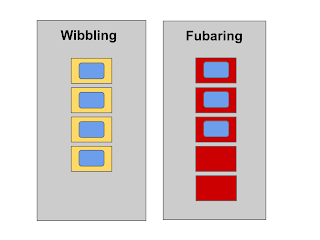 There's a different representation of lack of flow ; fat columns filling up (at the bottleneck) with two or three different coloured kanbans. 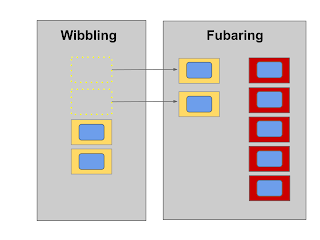 If the yellow Wibblers work faster than the downstream red Fubarers, the Wibbler's full yellow kanban get stuck downstream in the Fubarer's column, inviting the Wibblers to help the Fubarers. 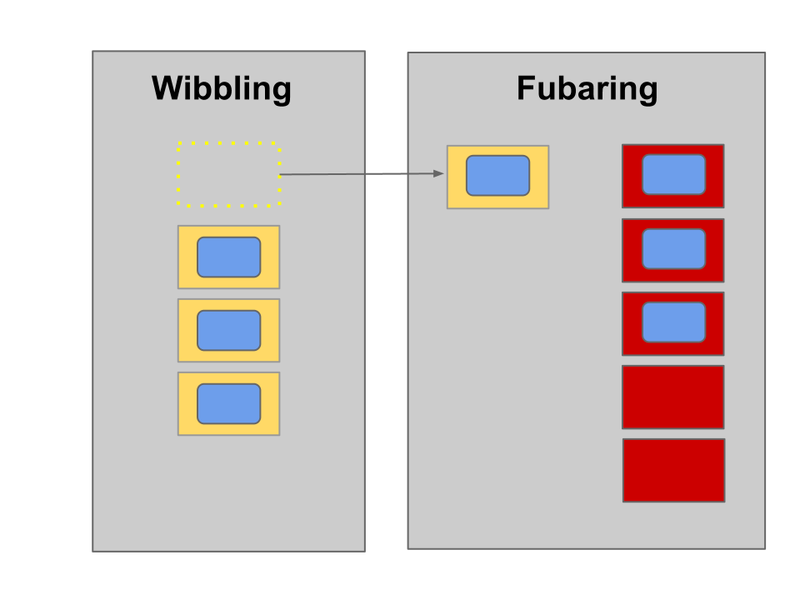 If the red Fubarers work faster than the upstream yellow Wibblers, the Fubarer's empty red kanban get stuck upstream in the Wibbler's column, inviting the Fubarers to help the Wibblers. pull does not preclude push; you can have push and pull. wip-limits are not limited to pull systems; wip-limits would help in push systems too. Many years ago, in a taxi, in Athens, I watched with a mixture of amazement and fear as my driver freed up both hands by steering with his elbows. It was quite an experience! Multi-tasking is a bad idea when you're doing tasks requiring "immersion". After being interrupted it takes you a long time to get back to where you were. One of the least talked about reasons why pair-programming can be so effective is that a pair seems to be much more resilient to interruptions than an individual. In other words, yet again, pair-programming is partly about programming, but it's mostly about the pairing. Jerry Weinberg observed that if you have two task to choose from you don't in fact have two tasks to choose from. You have three. Your third task is deciding which of the other two tasks you should tackle! Recently, on a train, a man sitting opposite me was reading The Telegraph. An article on the front page about multi-tasking caught my eye. 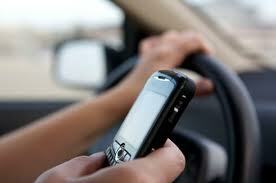 It quoted some research by Professor David Strayer from the University of Utah. It said multi-taskers often end up juggling activities not because they are good at it, but because they are easily distracted and cannot concentrate on the job at hand. And in contrast, the most efficient multi-tasker is the person least likely to do so because they can focus on one thing at a time. The implication is that someone who claims to be good at multi-tasking probably isn't!